exploring the surface. It is amazing that the two craft have survived for so long. Comets can tell astronomers much about the history of the solar system. Only a few space probes have been used to explore the nature of comets. NASA launched the Deep Impact space probe on 12 January 2005. The probe intercepted comet Tempel 1 in July 2005 and passed within 500 km of its nucleus. The probe fired a 370 kg copper slug into the surface of the comet at 10 km/s. Although Deep Impact collected vast amounts of data on the comet and the collision, it got no clear picture of the resulting crater; it was gone by the time the dust and vapour cleared. 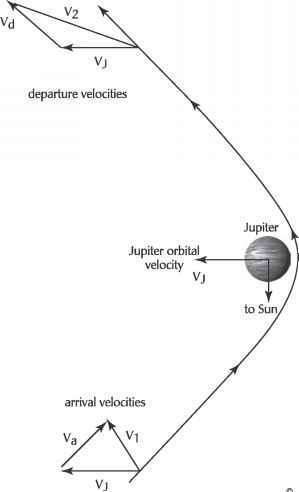 Tempel 1, a famous short period comet (5.5 years), is now out at its aphelion 4.7 AU from the Sun, just within the orbit ofJupiter. On 5 December 2008 the Deep Impact space probe will pass within 700 km of the comet Boethin. Two colour cameras and an infrared spectrometer will be used to observe the comet. Along the way, Deep Impact will act as a space telescope, making photometric observations of several stars with transiting exoplanets to improve our knowledge of their properties.